Our signature crisps really shine when topped with your favourite dip, cheese, or antipasto. Our customers have told us that lesley stowe raincoast crisps® are the perfect entertaining food to draw a crowd or a casual gathering. See why we call them ‘a crispy conversation starter®’. for our perfect pairing suggestions, use our pairing guide. The creation of these crisps brought an even crisper conversation to entertaining circles. Tart, plump cranberries and toasty hazelnuts combine to create a perfect snack for the holiday season and beyond. Delicious with Canadian aged cheddar. Ingredients: unbleached wheat flour, dried cranberries (cranberries, sugar, sunflower oil), pumpkin seeds, flax seeds, hazelnuts, brown sugar, organic skim milk powder, sesame seeds, baking soda, golden syrup, sea salt, honey, citric acid. contains: hazelnuts, sesame seeds, wheat, and milk. may contain other tree nuts. Combining the salty taste of Kalamata olives with the sweet flavour of succulent Californian figs, these crisps are a great snack on their own or perfectly enhanced with Canadian gouda & fig conserve. Ingredients: unbleached wheat flour, dried figs (with rice flour), pumpkin seeds, flax seeds, Kalamata olives, sesame seeds, organic skim milk powder, brown sugar, baking soda, golden syrup, sea salt, honey, citric acid. contains: sesame seeds, wheat and milk. may contain tree nuts & olive pits. Chock full of toasty pecans, rosemary and dark and juicy Thompson raisins, you won’t be able to get enough of these taste bud-tantalizing crisps. Amazing on their own, these crisps are even more fabulous when paired with Canadian creamy blue cheese and capicola. Ingredients: unbleached wheat flour, Thompson raisins, pumpkin seeds, pecans, flax seeds, organic skim milk powder, sesame seeds, brown sugar, baking soda, golden syrup, sea salt, rosemary, high oleic sunflower oil, honey, citric acid. contains: pecans, sesame seeds, wheat and milk. may contain other tree nuts. In response to our customers’ request for a saltier flavour, we coated the top of this crisp with a dusting of coarse sea salt and partnered that with a yummy combination of luscious dates and sweet almonds. Don’t go dateless; we love the match of Canadian applewood smoked cheddar. The Salty Date and Almond crisp was the 2013 sofi™ Winner, Outstanding Cracker at the Fancy Food Show in New York. 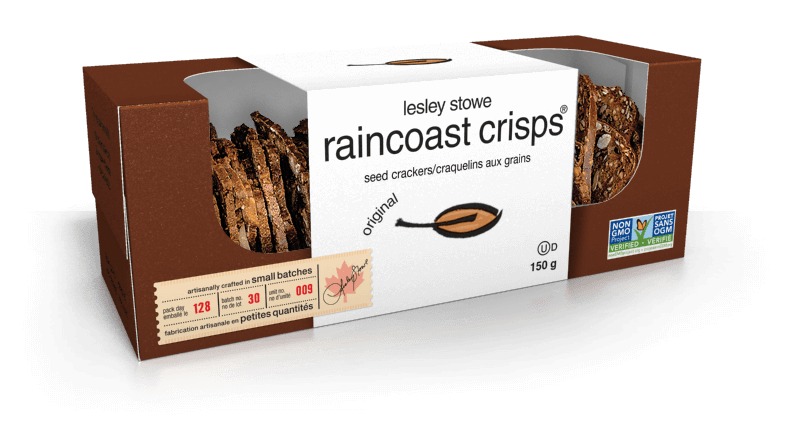 Ingredients: unbleached wheat flour, dates (with oat flour), pumpkin seeds, almonds, Thompson raisins, rolled oats, flax seeds, sesame seeds, organic skim milk powder, brown sugar, sea salt, baking soda, golden syrup, high oleic sunflower oil, honey, citric acid. contains: almonds, sesame seeds, wheat, oats and milk. may contain other tree nuts. This is where ‘a crispy conversation starter®’ began and it hasn’t stopped since. Lesley’s favourite, this unique and addictive crisp is also the most versatile. A toasty, nutty flavour with a slightly sweet finish, the original crisp has hints of spice and goes well with smoked salmon, seafood and antipasto, as well as a myriad of cheeses. Ingredients: unbleached wheat flour, pumpkin seeds, flax seeds, sesame seeds, brown sugar, organic skim milk powder, blackstrap molasses, poppy seeds, baking soda, sea salt, citric acid. contains: sesame seeds, wheat and milk. may contain tree nuts. 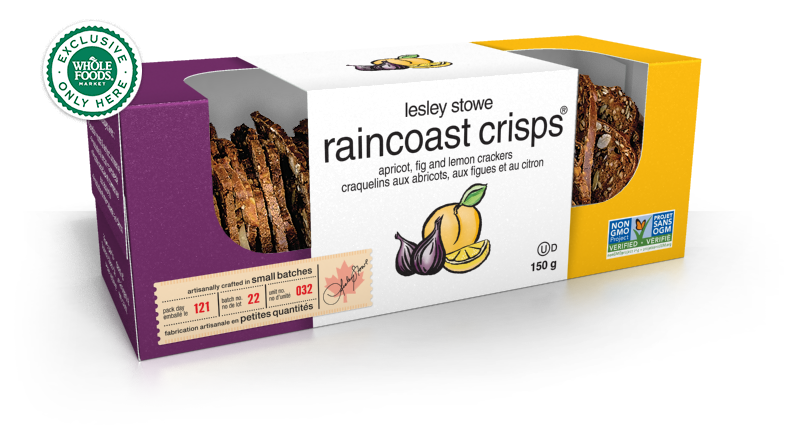 Available exclusively at your neighbourhood Whole Foods Market, these crisps combine the perfect balance of fresh flavour that is certain to elevate all of your entertaining occasions. 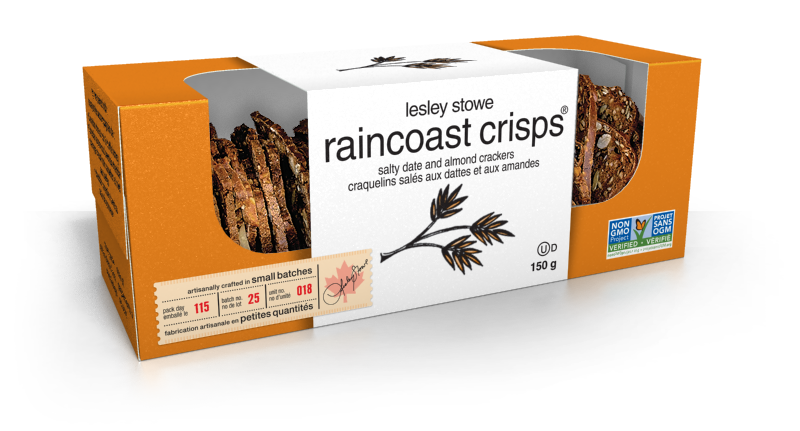 Irresistible on their own, or try them paired with Canadian ricotta & apricot conserve at your next gathering! Ingredients: unbleached wheat flour, Thompson raisins, dried apricots, pumpkin seeds, dried figs, flax seeds, organic skim milk powder, sesame seeds, brown sugar, sea salt, baking soda, golden syrup, lemon peel (lemon, sugar, lemon oil), rice flour, high oleic sunflower oil, honey, citric acid. contains: sesame seeds, wheat and milk. may contain tree nuts and apricot pits.